It rained like hell yesterday. We had two inches between noon and 5 pm, and it was still raining when we went to bed last night. Gads. As we were rushing around yesterday evening to make sure everyone would be warm and safe and dry for the night (my mantra… everyone MUST be warm and safe and dry), look at what we discovered in the goat stall. Three beautiful, perfect guinea eggs. A couple of guineas from next door seem to have moved in over the last week or so. 9/23 Note for Posterity: Meteorologists recorded 1.74 inches of rainfall at the Albuquerque International Sunport – the greatest amount in one day Since October 22, 1969. I wouldn’t mind all that rain — I would LOVE all that rain — it just seems such a waste when it comes all at once. The ground can’t absorb it fast enough and it just makes a mess. A big muckety, muck of a mess for sure. You mean goats lay eggs in New Mexico??? I need to travel more! Hmm…if they hatch on your side, is it finders keepers? They are great at keeping the bugs away! Wow! So much rain indeed! So delicate the guinea eggs! In Portuguese the translation of “guinea” is “galinha-d’angola”. Too much rain! 🙂 Why, thank you so much for the Portuguese translation… we’d love to have more translations if and when you’re ever in the mood to share! Do people eat guinea eggs? I had an old Aunt who always raised guinea’s but we didn’t live near her and I don’t know … just wondering. We had a pet duck and my Dad would eat the duck eggs. I was wondering the very same thing last night. I looked it up – and the answer is yes. Apparently, two guinea eggs = one large chicken egg. 🙂 Do guineas ever stay put? I think they were drawn to your place by the similar song the donkeys sing to their own. You goin’ fishing in that side paddock? We had a very strong thunderstorm but not a drop of rain. Sure could use some moisture here in Virginia! I sure hope you get some! Hugs to Handsome and Rowdy – and you! I would think the burros would welcome the rain on their itchy skin. Do they stay out in it some? The boys tend to not like the rain – especially the downpours that we had yesterday. The rain doesn’t slick off of them, but rather soaks in – and generally ends up making them quite miserable if they wind up soaking wet. What a fun little surprise….the eggs, I mean, not the torrential rain. Harry and Gunny don’t like the rain, how about your boys? We desperately need rain, but last year the first storm of the season toppled a pine tree onto our garage. Hoping it will come in a little easier this year. You will have daily surprises when you get the chickens, and many more photo ops to keep us amused. It was a fun surprise! 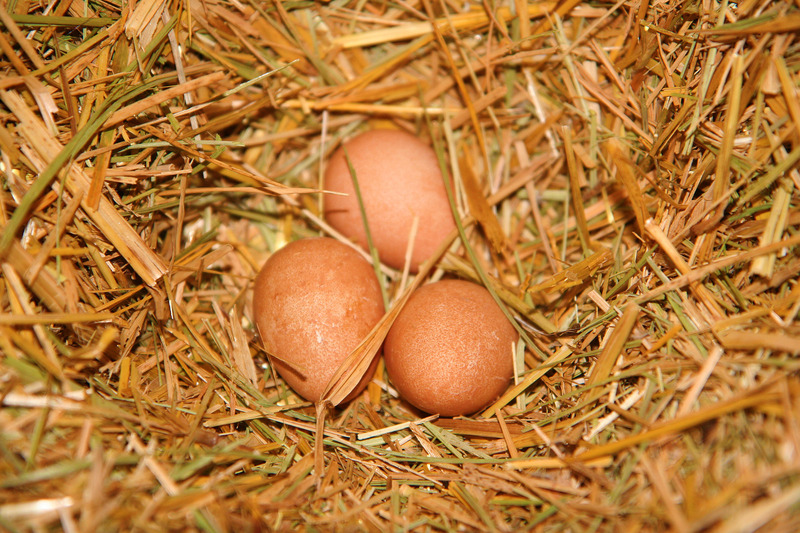 I was pleasantly shocked to find the eggs in such a perfectly carved out little nest in the straw. Totally cool. The boys definitely don’t like downpours like we had yesterday… I had such a hard time sleeping last night worrying about them. I count on them to stay in (warm, safe and dry), but sometimes come out in the mornings to find them soaking wet if they’ve been out in the rain overnight. And will the Guineas help with the fly problem next summer? We’re always happy to see guineas in our yard eating one bug or fly away at a time – yeah! We could use some of that rain over here. Could you send us some, please? The guinea eggs are a nice surprise. Do you plan to eat them? I am thinking that’s a sign you really must get some chickens for your farm! We’d be happy to send some rain up your way! I think we’re going to skip eating these eggs because we’re not 100% sure when they were laid. I’m 99.9% sure it was yesterday, but I can’t be absolutely positive. No worries, though, because Carson brought us six fresh eggs from 7MSN this morning! I guess the neighbor’s guinea hens must like your mantra! 🙂 Wow you guys really got soaked! We had about .75 inches Tuesday night. I saw it was headed your way. What a wonderful endorsement for the home you provide all your critters that the guineas would entrust their offspring to your side of the fence. They’re obviously not a couple of dumb clucks. I sent Ellsworth your smooch. He sent two back. We must be getting the rain today that you had yesterday. Here in northeast Kansas, it started raining a little after noon, and has been raining ever since, and now it’s 4pm. It shows no sign of stopping. But this means that the hubby can stop combining corn, and spend time with me, selfish soul that I am, I miss the hubby. We had a wet week which made Lake Beamer appear again, but glorious sun for 2 days now. 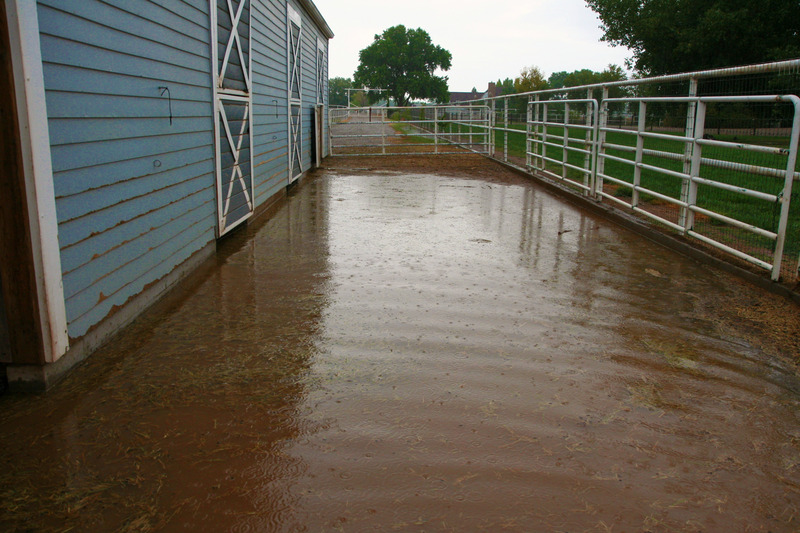 I had the neighbour trench Beamer’s pen and now it drains nicely- no more wading! I swear I was thinking about you and Lake Beamer last night and this morning! If you had some chickens, you could tuck those eggs under a broody hen and have your own flock of guineas! Guineas are pretty poor parents so I think those eggs are doomed!